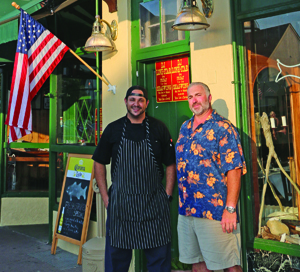 An end of an era or a new beginning for Montauk’s iconic Tavern? 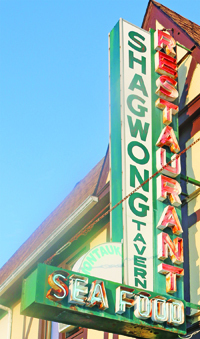 Built in 1927- formerly called Montauk Tavern, Shagwongs is still standing tall on Main Street in the center of Montauk Village welcoming visitors to join the locals who frequent the comfortable bar and restaurant. 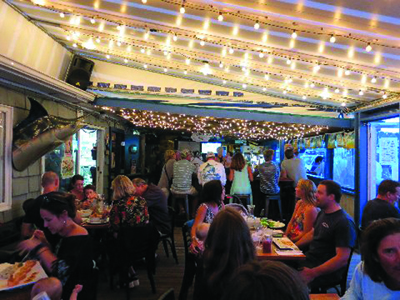 After the clean-up new owners Jason Behan, Jon Krasner and Beau Campsey have decided to keep Shagwong’s place in Montauk’s history alive. Although some of the names have changed, and it certainly has a new shine on the inside- including the new and improved kitchen- Shagwong continues to be a neighborhood bar; walking by one can always find the barstools occupied by friends enjoying an afternoon snack or drink surrounded by the familiar photos and memorabilia that is Shagwong. Open daily for lunch and dinner, depending on your preference, you can sit in the bar, the indoor dining room, or on a sunny afternoon outside on the shaded patio. When you visit the tavern, you’ll recognize some of the old familiar friendly staff faces, as well as some new ones like Tom our waiter, and John behind the bar. The newest and one of the most important members of the staff is Julius the head Chef. Born and raised in Arkansas, which is also the roots of his 17years of cooking experience, his most recent including some time in Sag Harbor and Nashville. Julius has created a menu that at first glance may appear a typical tavern menu- but at closer look you discover he’s put a creative twist on many of the traditional items as well as adding some hidden gems. During our meal, we sampled a number of them including from the appetizers; Mussels in white wine and garlic, Kale Caesar Salad with garlic Croutons and shaved Parmesan Cheese, and the Shrimp and Lobster Cake served with a Chile Aioli. The mussels were garlicy and fresh, while the lobster and shrimp cake with the aioli was a delicious alternative to a crab cake. 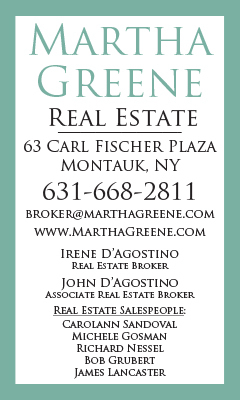 The salad was crisp and delicious; I love Kale and their Caesar dressing was excellent. After speaking with the chef about some of his favorite dishes, Tom our waiter brought out the Lobster Sliders on fresh toasted Artisan Rolls. We thought they were the favorite, full of lobster meat and the rolls so fresh and tasty, but then he sent out the Surf & Turf Sandwich. Oh my- this tender sliced filet topped with lobster claw meat with a light sauce that perfectly complements both flavors is hands down the best sandwich I’ve ever eaten. 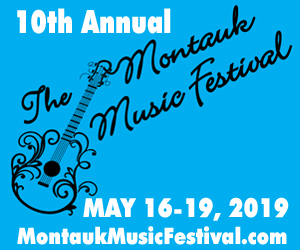 Next was the Montauk Fish Taco which is listed as Mahi-Mahi but when a fish is running in Montauk they substitute it. 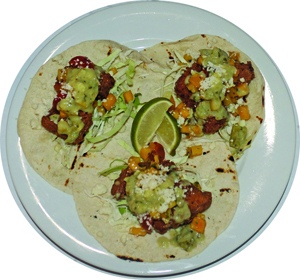 Ours was Striped Bass marinated in Driftwood Montauk Beer and gently fried in a light crisp batter and served with Cabbage, Chipotle Mango Salsa, Creamy tomatillo Sauce and Cotija Cheese. I usually prefer grilled fish taco, but this was light with a unique delicious blend of flavors. A special of the evening was the Crispy skin on Stripped Bass with sautéed spinach, and again, the fresh Bass was bursting with wonderful flavors. Finally, coming highly recommended by Tom, we had the Fettuccini & Sea Scallops. I don’t enjoy thick sauce on my fettuccini so I was a little hesitant, but Tom promised that it wasn’t like that, and he was right, it’s a perfect light summer dish. The thick scallops were seared to a golden brown on top and tender throughout, sitting atop a dish of light Meyer Lemon and cheese coated fettuccini with asparagus and pancetta. 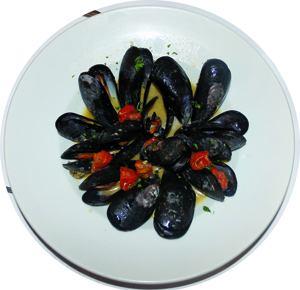 Each of our dishes were so delicious, even the hand-cut French Fries that accompany the sandwiches were excellent. It seems that the new Shagwong has undergone a metamorphosis and emerged into a tavern with a culinary twist. In addition to his menu, Julius offers nightly specials and a weekend smoker menu that will also be part of their Sunday Football Smoke Fest. They continue to have late night DJ and Live music every Saturday night. So for a drink, food, or a night out, come down and check out the New Shagwong… you won’t be disappointed.